As always, thanks for taking the time to stop by for a visit and I appreciate all the sweet comments that you make. Absolutely beautiful! LOVE the cherry paper,looks great! Beautiful card, Julie. How is your niece and is she still in the hospital? 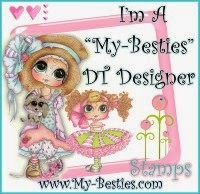 Utterly adorable, beautful layout and embellishemnts. Tilda is coloured to perfection. I can't see a thing wrong with it. 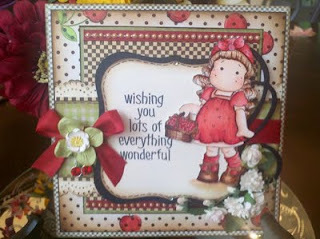 What a wonderful card and I love your cherry paper as well as everything esle! All I can see is a absolutely gorgeous card! This card is so adorable! I LOVE your cherry paper!! I think your card is perfect!!! Tilda is colored wonderfully and your paper is perfect! Love it Julie! I love the way you put together your card-stunning! There's nothing missing from this card at all! It's gorgeous and has that Mary Englebreight (sp????) look to it! Coming up with your own cherry paper is a wonderfully creative idea. Excellent job! Well your card does not seem off to me!! I too think it is awesome. You are probably looking way to hard - this card is perfect! I think you have done a wonderful job - with your paper - your design work and your coloring. Beautiful! Love the paper and layout! Great card! WOW....you did a magnificent job showcasing this adorable Tilda...perfect papers and details!! This is a totally awesome card. Wow super cute card!!!! Beautiful papers and coloring!!!! You did a great job!!! !